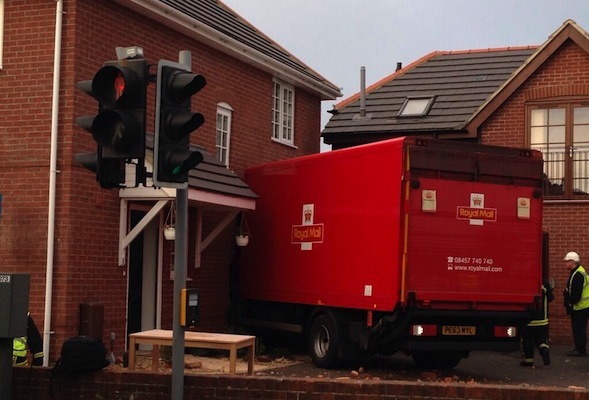 A Hampshire couple had a shock special delivery when a Royal Mail lorry crashed into the side of their house. The 7.5-tonne vehicle embedded itself four foot into the side of the building – which was built only a year ago – at 5.45am today in Gosport, Hampshire. Anne and Len Wiles were asleep when they were rudely awaken by an almighty crash. Firefighters rescued the couple, who were unhurt, from an upstairs window while the driver of the lorry was shaken, but unharmed. As the lorry careered off the road it mounted the kerb, crashed over a wall, smashed into two parked cars before coming to rest in the side of the house. "I was lucky as I had been planning to go downstairs 10 minutes before the crash happened," Mr Wiles told the Portsmouth News. "We opened the door and there were no stairs – instead we could see a lorry. The fire brigade rescued us and were brilliant." Houses either side of the accident were evacuated by emergency services and three families are to be rehomed while repairs are made. Emergency planners from the local council were on the scene this morning assisting those affected. To add to the misery, the Wileses had recently sold their home – and that's now been put on hold. Paul Cox, of the fire service, told the local paper: "We have been to quite a few buildings with vehicles inside them. We got here at about 6am, and there were two people trapped in their home on the upstairs floor. We decided to remove a window and get the couple out."